For this weeks Looking Outwards, I found ikrsek’s looking outwards 5 to be particularly interesting, which discussed the work of Hayden Zezula. Hayden Zezula is an animator who creates designs for companies such as HBO, Adidas, and Adult Swim. To sum his work up in a word… unsettling. A lot of Zezula’s work, to me, explores the relationship between 2D and 3D. This perhaps differs or expands a bit from ikrsek’s description of his work as a “3D style on a 2D screen”. 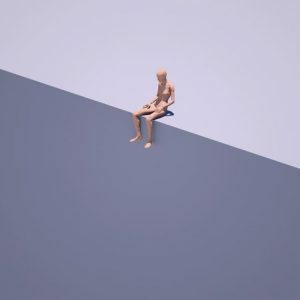 Hayden Zezula’s “end”, a gif depicting a 3D human leaning over and covering his/her face with his/her hands in a 2D landscape. This image on “end” for instance, shows a 3 dimensional figure sitting on a pretty 2 dimensional surface. The relationship between the two is both visually and thematically interesting. Also, as ikrsek mentions, much of Zezula’s work has to do with texture. This, to me, is the most interesting aspect of his work. The image above shows the kind of unsettling contrast between textures that Zezula likes to use. In fact, it’s much more unsettling if you watch the gif, since part of texture/material is shown through movement (for example, the tongue sort of ripples when it hits the top of the mouth). Not only is this visually really interesting, but actually I think Zezula is working with deeper ideas of the relationship between synthetic and organic things, like how organic things like humans and plants can be defiled by synthetic things; How what should be organic can be “replaced” by something synthetic; and how unnatural organic things can be when twisted and manipulated.